I only went to the Fringe for a couple of days this year, but if I’d been for the whole month, Drip would probably have saved my life. Up for a short run, just the last week of the Festival, this stripped-back, simply staged one-man show – directed with detail, care and a winning small-ness by Jane Fallowfield – is so heartwarming, it should probably be on prescription for anyone struggling with the over-boozed, over-damp, high-pressure powder keg of the Edinburgh Fringe. Written by Tom Wells and performed by Andrew Finnigan, Drip is the story of Liam, a teenage boy who’s recently moved to Hull from South Shields. His best and only new friend, Kaz, is keen to spend summer working towards the September school assembly with a prize for the best project – and she persuades Liam to join her synchronised swimming team, even though there’s only two of them in it, and Liam can’t swim. It’s a story that delights in the beauty of the small and of the every day, and indeed was originally developed by and for young people in Hull, as part of Root Theatre’s project Script Club. Soft-spoken Finnigan plays Liam with bags of understated charm, and it’s an impressive feat to be so convincing as a shy, gentle teenager, but still make the audience feel so held and relaxed. 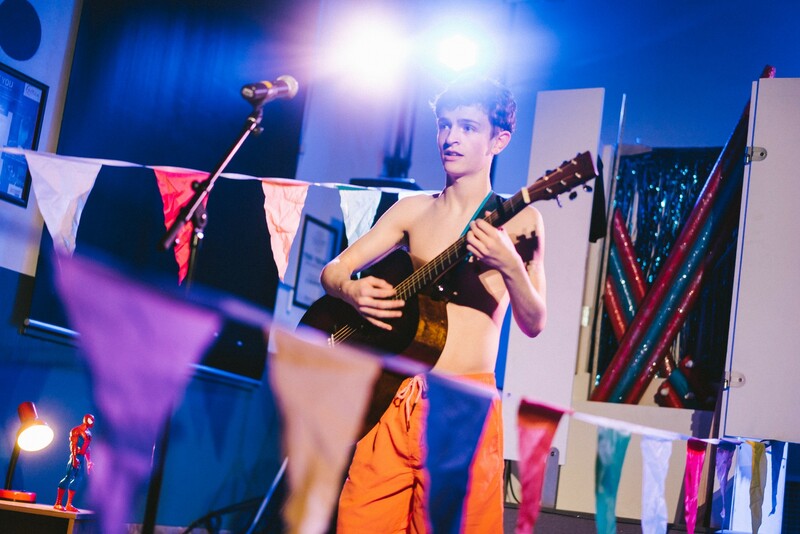 Part of the story is told through the light, folky songs Liam has spent his summer holidays writing, composed by musician Matthew Robins, and performed live by just Finnigan and a guitar. There’s a Gavin Osborn-y vibe to the music which goes well with the gentle nature of the story itself, and Tom Wells’s deft writing is full of warm, generous humour and wry observation. On paper, I risk making it sound saccharine, but it’s just lovely. There’s a naturalism in Wells’s writing that keeps everything realistic, without ever being beholden to the kitchen sink misery that so often goes hand-in-hand with writing about working class teenagers. Class, privilege, structural inequality, homophobia – they are all there, built into the world of the show, affecting the characters, but not controlling them, or defining their interactions with the world. Liam’s confident, unfazed about being out as gay at his inner-city school, but he understands why other people – including his crush, a boy from the year above with a passion for swimming – might not feel able to do that yet. Drip probably isn’t going to change your life, but it’s a moving, uplifting hour from a talented creative team, and it will leave you with a warmed heart and a spring in your step. Drip was on at Paines Plough’s Roundabout space at Summerhall from 20th-26th August. More info here. It also tours to Bush Theatre from 3rd to 22nd December – more info here.